Now you can readily make Greek yogurt at home with the help of the Euro Cuisine GY50 Greek Yogurt Maker. This yogurt maker transforms homemade, or supermarket bought yogurt into rich and thick Greek yogurt within a couple of hours. It does all of this when you place the Euro Cuisine GY50 Greek Yogurt Maker inside your fridge, which takes the hassle out of making homemade Greek yogurt. Holding up to two quarts of yogurt, this kitchen appliance will save you both time and money. You can forget about having to wait in a long line at your local supermarket to simply purchase a single container of yogurt. Instead, you can put the Euro Cuisine GY50 Greek Yogurt Maker to use and take the initiative to supply yourself with your Greek yogurt. Once you start using the Euro Cuisine GY50 Greek Yogurt Maker, we can assure you that you’ll never go back to buying store brand yogurt ever again. You have the power to create spreads, salad toppings, and dips that are extremely healthy, and, as a result, you’ll notice a positive change regarding your well-being. 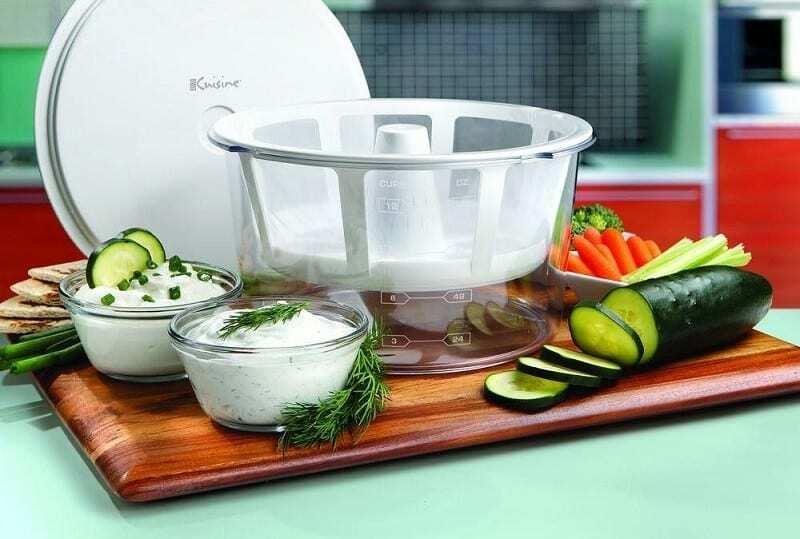 Anything you could make with the Euro Cuisine GY50 Greek Yogurt Maker would be considered healthy and natural, so it's a must-have kitchen item if you're trying to live a healthy lifestyle. Keep reading for a detailed review regarding the features of the Euro Cuisine GY50 Greek Yogurt Maker. 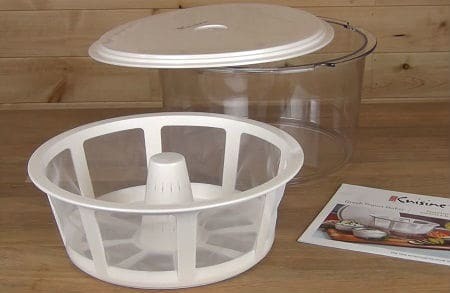 The Euro Cuisine GY50 Greek Yogurt Maker is made entirely out of plastic, which many people are worried about since plastic is known to emit toxic chemicals into the surrounding food. However, Euro Cuisine doesn’t sell subpar items, so they went above and beyond to ensure that the plastic they use is BPA free plastic. Many of the kitchen appliances you use actually do contain BPA in them. Since Euro Cuisine is a European based brand, they adhere to European standards of food safety, which tend to be stronger and stricter than that of Americas. For those who have no idea as to what BPA is, let us break it down for you. Ever since the 1960’s, BPA is known to be an industrial chemical that’s used to produce plastics. This chemical when exposed to certain temperatures will permeate its way into your food, which is not healthy for you in the long run. Then you’ll be glad to hear that the Euro Cuisine GY50 Greek Yogurt Maker contains plastic that won’t harm your food. Buyers love how the Euro Cuisine GY50 Greek Yogurt Maker is finally made available elsewhere other than the European market. You no longer have to buy store brand yogurt since you can quickly make your own at home with the Euro Cuisine GY50 Greek Yogurt Maker. Euro Cuisine is one of the only kitchen appliance manufacturers to provide top-tier European kitchen products in the U.S market. Those who miss the yogurt of their homeland can easily prep what they desire using Euro Cuisine products. The brand has begun to gain popularity in the American market, so you should go ahead and equip your kitchen with all the appliances that Euro Cuisine has to offer. The Euro Cuisine GY50 Greek Yogurt Maker blends functionality with innovation to result in a beautiful European inspired kitchen tool. Euro Cuisine doesn't only sell its reputable yogurt maker but also sells a waffle maker, which buyers typically purchase together. If you want a product that’s meant to last you a long time, then you should seriously consider purchasing the Euro Cuisine GY50 Greek Yogurt Maker. This particular Euro Cuisine product promotes healthy cooking that’s done in a modern way. Typically, to make Greek yogurt, you need to filter the liquid through a paper bag or cheesecloth to achieve its consistency. With the Euro Cuisine GY50 Greek Yogurt Maker, you can say goodbye to these archaic yogurt making techniques because the device can do it for you. 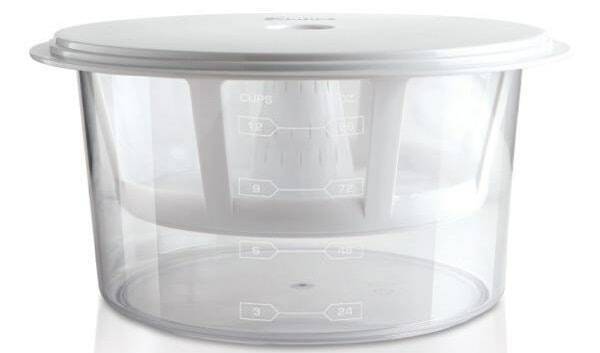 Based on positive buyer reviews, the fine mesh strainer that comes included with the Euro Cuisine GY50 Greek Yogurt Maker is effortless to clean when compared to a cloth strainer. The container is large enough that it can hold up to half a gallon of yogurt. While the yogurt sits in the container, it strainers out the whey within hours to result in a Greek yogurt of thick consistency. When compared to other Yogurt Makers of the same quality, the Euro Cuisine GY50 Greek Yogurt Maker is a much less expensive option. This is something to take into consideration if you don’t have the budget for a high-end Yogurt Maker. For those who aren’t used to using a Yogurt Maker, you can use it for more than just making yogurt. The whey that gets strained out actually has several uses that can be convenient around the house. You can use the whey as a plant fertilizer, meat marinade, and even as a facial mask. Sometimes people use the leftover whey as a soup base or for baking bread. As you can see, the applications for whey are plentiful, so it’s up to you to make the most out of what you get with the Euro Cuisine GY50 Greek Yogurt Maker. After taking a look at all the online retailers that sell the Euro Cuisine GY50 Greek Yogurt Maker, the one that a majority of buyers depend on is Amazon. Out of all the yogurt makers that Amazon sells, the one that has earned the title of Amazon's Choice is, in fact, the yogurt maker we are reviewing here today. A lot of buyers seem to be happy with the results of this yogurt maker, so we can assure that you will too. 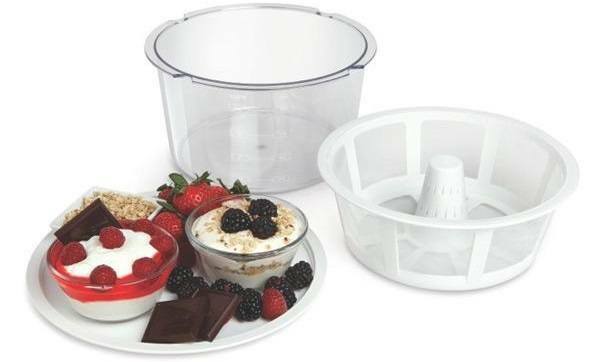 For under $20, you can transform your diet with including the Euro Cuisine GY50 Greek Yogurt Maker as part of your kitchen equipment. Hopefully, you have made up your mind and decided that you do need a Euro Cuisine GY50 Greek Yogurt Maker in your life. Once you start making your Greek yogurt, you'll be amazed at how much better your body will feel. The sugar content in the Greek yogurt made out of the Euro Cuisine GY50 Greek Yogurt Maker is much less than the one found in the store-brand version, so your life can truly improve by making the switch to this kitchen product. I highly recommend buying the Euro Cuisine GY50 Greek Yogurt Maker so your health can reap the benefits.